Eliza Kenney, BVM and Judith Dewell, BVM (John Marie) hang “Birds of Paradise,” a painting by secondary art teacher Fleurette Blameuser, BVM. The establishment of display criteria for Mount Carmel’s public spaces helped to meet the challenge. The primary objective was to feature the work of BVM artists and pieces significant to BVM history and missions. Opportunity came in the ability to view large works never before displayed. These included paintings by Helen Kerrigan, BVM (Paulita), then art professor at Clarke University in Dubuque, Iowa, and Blanche Marie Gallagher, BVM, former art professor at Mundelein College in Chicago. Once these found a home, smaller pieces completed the décor. BVM artists include the professionally trained as well as sisters who explored their artistic talents during retirement. Many of the latter studied at Wright Hall, a BVM retirement residence in Chicago, under Mary Eustella Fau, BVM, and later Vivian C. Wilson, BVM (Lauren). The closing of Wright Hall in 2011 sent an influx of art to Mount Carmel. While paintings and sketches comprise the majority of BVM art at Mount Carmel, collections of photography, pottery, and needlework have grown substantially in recent years. A number of works in these mediums, like the aforementioned ones, received recognition for their artistry. 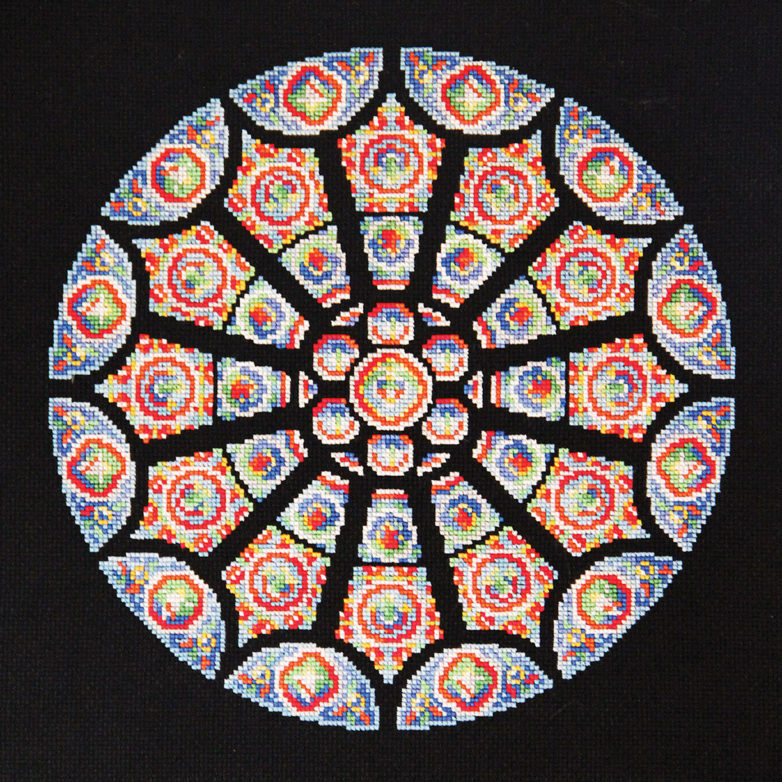 The needlework exhibit in the Motherhouse Prairie Room featured crewel, cross-stitch, needlepoint, string art, and tatting. 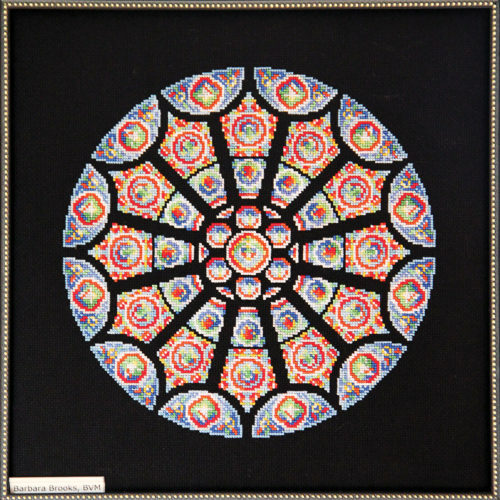 It included a needlepoint by Barbara Brooks, BVM (Donna) that received second place in original design in the 1996 needlecraft competition sponsored by the English publication New Stitches (see left). Currently, a collection of pottery by Carmelle Zserdin, BVM, former art professor at Clarke University, fills the display case (see gallery). 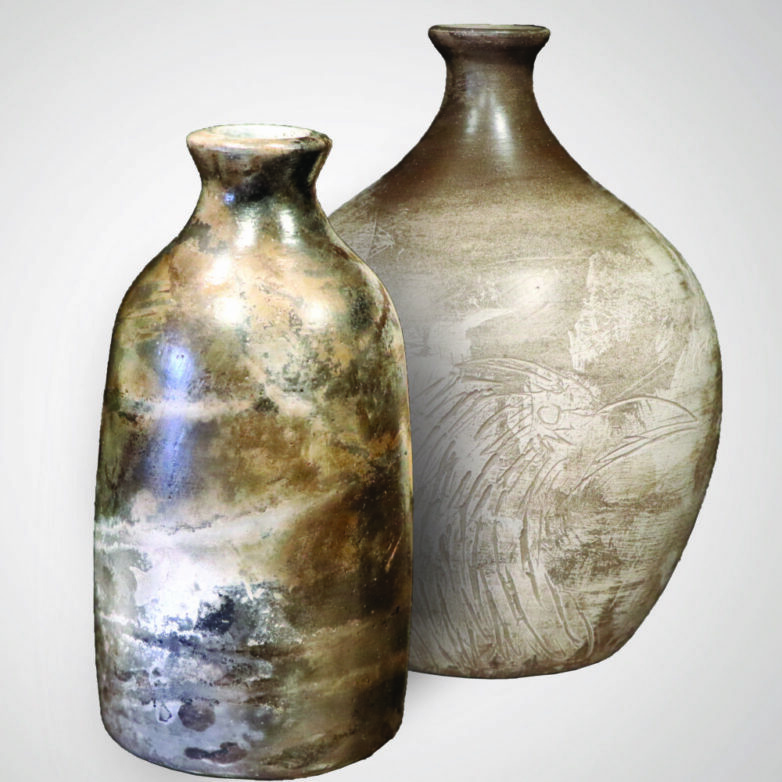 Also on display is pottery by Genevieve Kordick, BVM who received multiple awards in Best of Category—Pottery, Professional Division, from the Arts & Recreation Council of Greater Des Moines (Iowa). 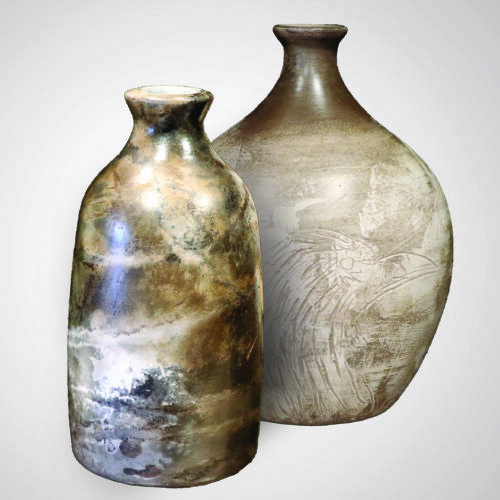 Charmaine LeMaire, BVM earned several recognitions for her hand-painted ceramics, including the 2001 Freddy Award, the highest award given to a non-professional by the Iowa Ceramics Association. Her prized 14–piece nativity set is on display in the Motherhouse at Christmas. 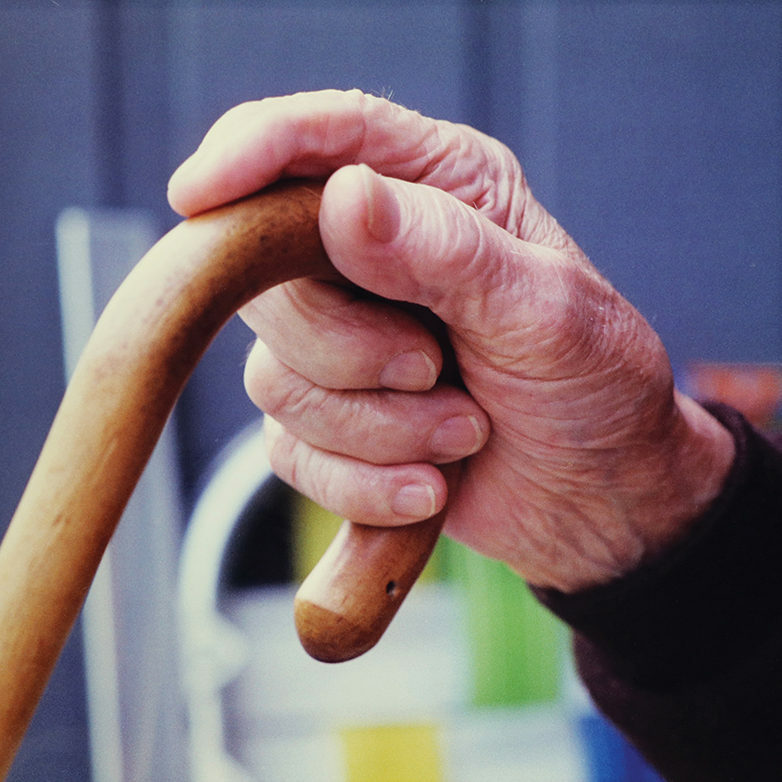 Photographs by Helen Marie Wolkerstorfer, BVM (Edith) hang throughout Mount Carmel, including the award-winning “Angel in Waiting,” the photo of her 90-year-old father’s hand on his cane (pictured in gallery). Her other displayed works include several selected from among hundreds of entries for the juried mixed media art show at Westmont College in Santa Barbara, Calif.
Just as the art collections have expanded through the years, so has the responsibilities of the curator. The first curator, Jean Monica Lanahan, BVM, appointed in 1991, focused on the care and display of artifacts and artwork in the Motherhouse and the training of docents to give tours of the Heritage Rooms. In addition to these duties, Eliza handles the placement of art throughout the Mount Carmel campus as well as floral arrangements and seasonal decorations for the Heritage Rooms. Since 2010, Judith Dewell, BVM (John Marie) has assisted Eliza, particularly with Christmas decorations and rearranging artwork. Keeping track of the art is a huge undertaking. Jean Monica created a database to assist her in the task, which proved invaluable during the Motherhouse renovations when art was temporarily packed and stored. Later, Regina M. Qualls, BVM, former Secretary of the Congregation, and Thea O’Meara, BVM, her administrative assistant, designed a new, expanded database. Thea was instrumental in adding photos and detailed descriptions. 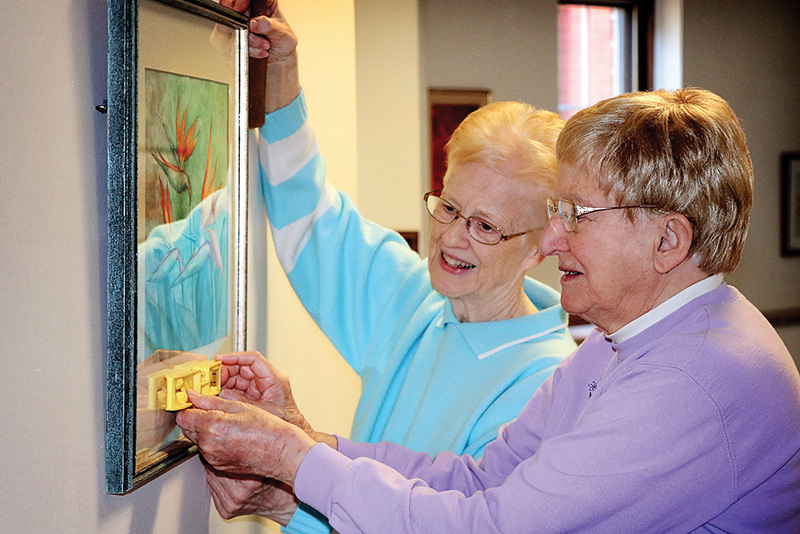 The database continues to grow as sisters retire to Mount Carmel, along with their collections. About the author: Associate Christine Olsem is the administrative assistant to the Secretary of the Congregation. Summer Salt 2018: Worship, Work, and WIN! Win or lose, the Loyola University Chicago Ramblers know they can count on the love and support of their 98-years-young chaplain, Sister Jean Dolores Schmidt, BVM. This year’s NCAA Men’s Basketball Tournament (a.k.a March Madness) propelled Sister Jean and her team to the Final Four—and gave the world a chance to see BVM values in action. Read more about Sister Jean and the BVM Legacy of Love. 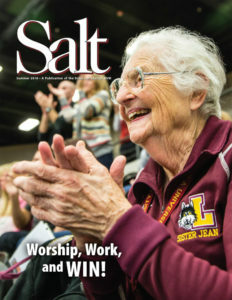 If you would like to receive Salt, contact the Office of Development for a complimentary subscription at development@bvmcong.org or 563-585-2864.